After the successful trial of 4 prototype Dennis Jubilants (N1-4) in 1977-8, Kowloon Motor Bus ("KMB") placed orders for production version of the front-engined model. Unlike N1-4, those bodies were supplied by BACo, these buses were fitted with Alexander bodies. 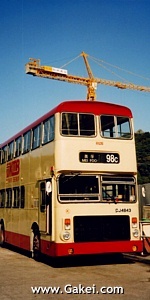 First 4 Alexander bodied Jubilants (N5-8) were registered on 11 May 1979 as BY 6592-5. Totally there were 360 production Jubilants introduced but only first 210 were fitted with Alexander bodies. Among these 210 buses, one (CF 4180) was installed with an air-condition unit for evaluation purpose. The trial was finally a failure and the air-condition unit was removed. The bus was then returned to service as a non air-conditioned bus and KMB allocated N364 as the fleet number for the bus. 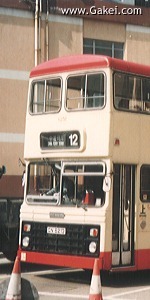 The remaining 150 (N214-363) Dennis Jubilants were fitted with Duple Metsec bodies. Please click on the respective links or relevant photographs to access the pages of Alexander and Duple Metsec bodied Dennis Jubilants. Please click on the photographs to view the enlarged version.